oooooil can! *squeak! * oooooil can! Many of you have wondered why Critiki hasn’t been updated as much in recent months. I’ll skip to the ending you want to know: updates are coming this week. I’m ready now to start tackling my hefty backlog. So here’s what happened: as it is for you, Tiki is my great escape. And Critiki is my most favorite escape playground. I’ve been running this site for fifteen years now, and I only love it more each year. But also, I am a grown up, with grown up concerns, and most importantly, a family. My family comes first, and my family has needed me. I could have continued with the Critiki updates while handling things needing my attention in my personal life, but Critiki is one great big dessert to me. I didn’t want to risk using it as an unhealthy escape. It pained me to do it, but I made Critiki hands-off so I could ensure that my attention was fully on the really hard stuff that needed tackling. The hard stuff is still happening (don’t worry, we’ll all be okay—if we’re old in-person friends I’ll catch you up over a drink the next time I see you), but I feel like the risk of Critiki being an unhealthy distraction has now passed, and we can start to find a normal balance again. There are plenty of new tiki spots that have opened, or are about to (three in San Francisco alone, it’s crazy), a huge number of exciting home tiki bars folks have submitted (please accept my apologies, I know exactly how exciting it feels when you’re sharing your home tiki bar, and it must have been frustrating to not see yours appear right away), and a massive backlog of photos (I’ve been trying to tackle them through all of this, but that’s only happened in little spurts, it’s time to get ’em all approved). Expect to see all of that happen over the next few weeks. Also on the horizon: I’m giving a talk at this year’s Tiki Oasis in San Diego! It’s happening Saturday, August 11 at 10am, and it’s called Tiki Morning Coming Down. 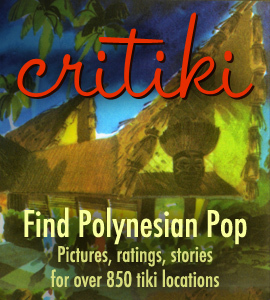 You’ll likely be nursing a hangover, so the idea is that we’ll all be taking it easy together, with a relaxing hour spent looking lazily at some of the most incredible bits of classic Polynesian Pop imagery, straight from the 10,000+ strong archive of images in Critiki, shared by Critiki members like you. Roll in wearing your tiki pajamas and dark glasses, carrying your coffee (spiked with some hair of the dog, I won’t judge), and I promise I won’t make you think or follow a plot or do anything. Just sit back, ooh and ahh, and start your tiki day right. Get your tickets now (Deluxe & Cocktail Tiki Oasis wristband holders, you’re already set, it’s included), and learn more at the Tiki Oasis website! Anyway, I’ve missed you. Let’s get back to tiki-work! Humu–It’s great to know you’re back, hands-on, within the pages of Critiki! Wishing you all the best. We’ve missed you! Welcome back! Where your ears burning? There’s been a little chatter recently over on Tiki Central about finding tiki places in a “post-Critiki” world (which I’m very happy to hear doesn’t exist yet). It is great news….it is an amazing resource! Thanks for all your work, and you definitely deserve some time away….every once in a while 😉 Looking forward to your Tiki Oasis symposium. Many blessings for all your endless work maintaining this absolutely exquisite website! Best wishes and biggest smiles for conquering whatever difficulties life has thrown your way. I am very excited for whatever knowledge you have to share at Tiki Oasis! Huzzah!! I feel guilty having been one of selfish folks who thought nothing of your personal life and your reasoning for a hiatus, being none of my business, and asking you outright what happened and where all my tiki news had gone. All I can say is I am so appreciative of your work and the fact that you were conscious enough to take the time you needed to take care of your family and yourself. Thank you again and forgive my selfishness. Happy to have you back and wishing you health and happiness. I’d rather use your site then the “Y “ word site, but that’s what people will look on in an information vacuum. Welcome back. We’ve missed you! Come visit us in Canada at The Shameful Tiki Toronto! Thanks Humu. Come visit us in New York – we’ve got some new-ish tiki bars for you to try out: Polynesian, Mother of Pearl, Dromedary, etc. I just happened to find out yesterday that I’ll be in NYC in a few weeks! Still working out the exact dates. Skipper sully here, I was your A/V geek at Tiki Oasis (I wa snot allowed to have a hang over – sorry) Glad to hear your getting back into the web site. You looked great and your presentation was wonderful at Tiki Oasis. Kind of sad it was not recorded in a professional manner – I think many would have loved to have seen it who could not attend. Any how – It was great to meet you in San Diego – You go girl!! !